People want to learn how to make cooling foods for this heat wave everywhere I go. From Miami to Canada and from the East coast to the West coast it is hot; not just hot but EXTREMELY HOT. Ohio for example has had many days in the three digits; the fields and gardens have dried up to nothing. Normally in Ohio and most of the country when the weather is hot, most of us like to cook outside. Grilling out helps to keep the house cool plus saves on the utility bills. With the kind of weather we have been experiencing, it is just too hot to be outside. It is also too hot to cook inside, especially a lot of cooking like using the oven. Learning how to make cooling foods made with quick and easy recipes are in big demand right now. A fresh caprese salad, cabbage or slaw recipes are perfect for this time year. 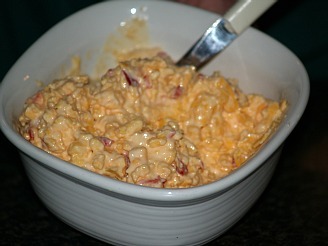 Sister Donna called and said she was hungry for pimento cheese spread. We reviewed the recipes and she made me hungry for it also. It is great not only on sandwiches and crackers but also served with a salad with many greens or on celery sticks. We all have the tendency to alter our recipes when we mix something up. Donna added lots of pimentos and used some other cheese for the Colby. Later, I talked to my brother and he wanting to know how to make some cooling foods; nothing sounded good to him. I was telling him about my conversation with our sister. He decided to make some of the pimento cheese spread too. He added all kinds of cheese; what he had on hand. He also added peppers and dried tomatoes. 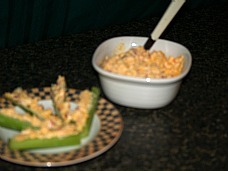 His came out a little spicy but had great flavor; delicious on stalks of celery and bread. I reported back to Donna about the chain she started; we all had a good laugh but this is a great recipe if you are looking for some cooling foods for this heat wave. It is good to keep on hand to make sandwiches for the kids or like myself, I use like a salad. Here is the basic recipe which we started with; for the mayonnaise, my sisters always use Miracle Whip. My brothers and I use Helmans or we make our homemade mayonnaise; it is all good so use your favorite. Grate or shred cheese in a large bowl; add pimentos and garlic salt. Add mayonnaise and enough milk to make spreadable. NOTE: My sister said she cuts back on the mayonnaise and added a little more milk; adjust as you like. Salads are always great cooling foods; they make delicious summer recipes which are so versatile to fit anyone’s taste buds. They can be very simple or more elaborate.In hot weather salads can be the entire meal. It can be as casual as a bowl of lettuce or include many vegetables, fruits and meats. These recipes can be quick and easy by using fresh vegetables, cheeses and cooked meats from the local deli. This spicy salad recipe is deliciously flavored with a peach dressing. It is among the cooling foods made with cooked deli turkey and put together with no cooking. NOTE: Do not handle jalapeno peppers with bare hands; use rubber gloves or manipulate with fork and knife to chop. Do not touch your face and carefully wash your hands when finished. The peppers contain capsaicin which can burn your skin and especially your eyes. In large bowl combine all salad ingredients; toss to mix salad. Pour dressing over salad and toss again to coat; serve immediately. Cooling foods include many recipes for wraps. They are quick and easy recipes to make and can be very flavorful like this chicken wrap recipe. Combine chicken, onion, tomato, avocado and eggs; toss gently. In another bowl combine vinegar, oil, sugar, salt, pepper and mustard; mix well. Combine both mixtures and toss to coat. Spoon mixture evenly down center of tortilla; top with chopped spinach and cheese. Fold up bottom and then fold over sides. This is a delicious idea for cooling foods. Everyone loves pizza especially if it does not require baking. Combine cream cheese, mayonnaise and horseradish sauce; blend and spread over pizza crust. Combine roast beef, tomatoes, lettuce and dressing; toss to coat. Top pizza with roast beef mixture; cut in wedges to serve.